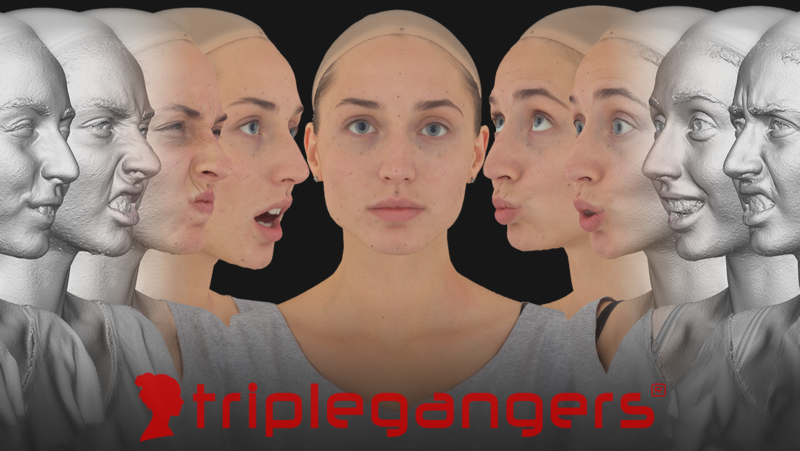 Triplegangers was original envisaged as a digital capture service for IR focused on digital doubles and likeness re-creation. We started to sell body scans but realized there is a stronger market for face scanning in particular. Model fees, model travel fees and scanning fees can become exponentially expensive as a service for clients. So we wanted to offer a very large database of real life models that have been digitized for use in visual effects and computer games, that are available at an affordable price. We plan to grow the store over time and update it with new models each month. We are using a standard 50x DSLR Canon EOS 100D setup, that we designed back in 2011. The system is simple but robust and now widely used by many studios to this day. We also plan to be releasing other sorts of captured data, such as photometric scans and multi-lighting reference. Scanning as a service can sometimes run into multiple (£) 5 figure sums, depending on what systems you use and what services you offer. We wanted to democratize this process and offer a large database of models from varying ethnic backgrounds, captured over 2 continents. Now available at a fraction of the production cost. These models could be used as hero characters or as background characters in any production. What makes our process different is that we offer access to the RAW data. The RAW .CR2 photographs and the RAW scan files. These are not an ‘artists’ impression of a scan, they have not been manipulated in anyway or re-sculpted as is often found with most online 3D scanning stores. Each model comes with the neutral expression as the base likeness and 19 FACS scans. Some products in the future will contain full FACS sets of over 40 expressions. These are RAW triangulated 7 million polygon meshes with original CR2 photosets, ready for retopolgizing and texture baking. Having this data will make it easy for you to perfect your own digital doubles which will fit your pipeline perfectly. All scans are correctly calibrated and match real life dimensions. 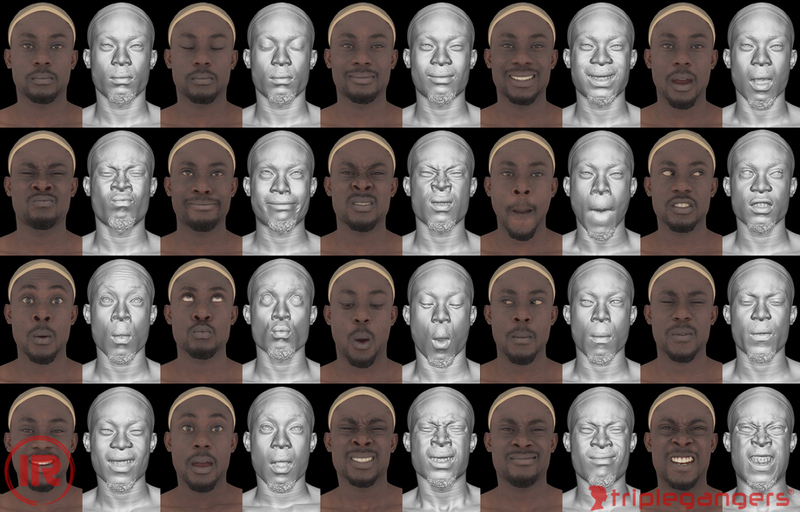 Each expression is rigidly tracked and aligned to the base neutral scan. Our 3D scanning system comprises of over 50x DSLR Canon cameras and a diffuse lighting system. 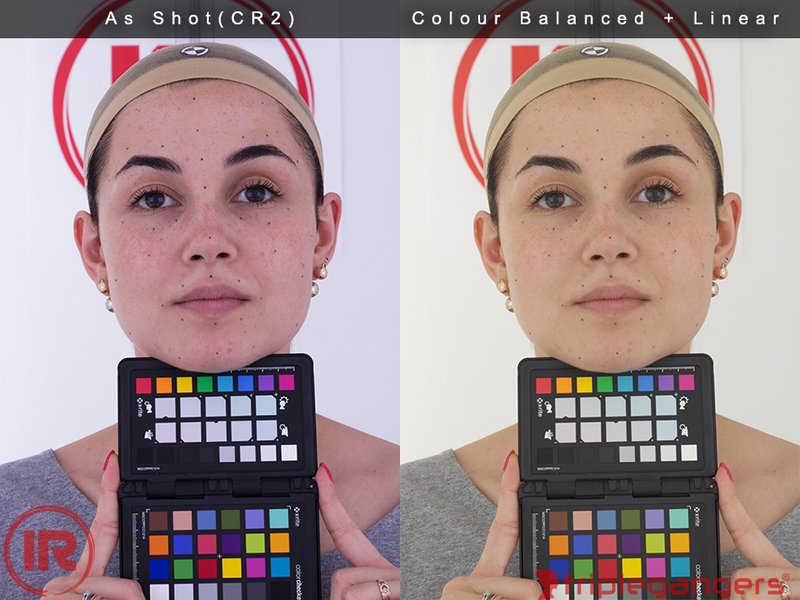 We soon hope to be releasing cross polarized data, multi-lighting reference, as well as Photometric scans from our IDA-Tronic DS1 scanning system later this year. Setting the goal to populate the store every month and aim to produce over 200 models by the end of the year. We will also be releasing tools, scripts and tutorials with the hope to engage with other creatives and industry veterans, to share ideas and techniques. We hope you like what you see and that you will be interested to purchase with us. Please email any of your ideas or concerns, or please do post below. Congratulations guys for the strong returning of the Triplegangers. I love your work. Something is saying to me that your name will become recognizable worldwide like the Coca-Cola brand. Good luck in your journey. Your perfect models associated with eye and facing tracking will allow the world to have incredible VR avatars for social interaction in Virtual Reality. Are you planning to publish the old demos of full body scans? I would love to see your work in programs such as Daz Studio but that depends probably not only on you. Thanks for the post. No we're not planning that anytime soon.